So, you’ve taken the plunge and you’re growing a moustache for Movember. You’ve received your membership to the ‘tache club and both Hulk Hogan and Tom Selleck were at your welcoming party. You had a pretty good time. By now you’re probably feeling more comfortable with your upper lip furnishing and looking to expand your horizons a little, but what more could possibly be done? 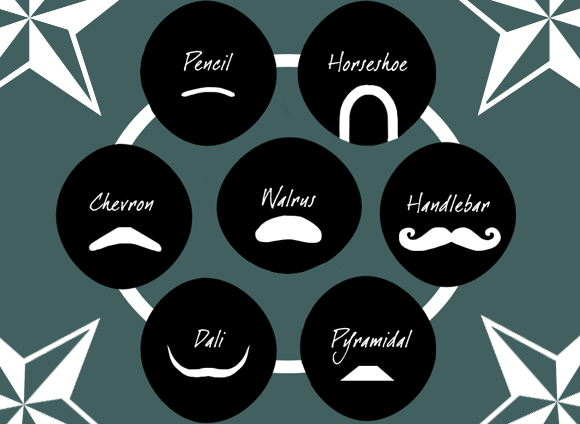 Some moustache styling of course! Any moustache that you style with wax and a comb is pretty amazing in my opinion. The handlebar must be long enough to be able to curl upwards at the end. Normally seen on truckers and 90s popstars, the Horseshoe extends from the regular dimensions of a moustache and curls around the mouth towards the chin. I am firmly of that belief that everyone who has a pyramidal moustache has a wardrobe full of suits. These are narrow on top, and wider at the bottom. Narrow, clipped and pretty hard to maintain, the Pencil is also known as the ‘mouthbrow’ as it makes your mouth look much more attractive. This is the moustache equivalent of ‘I just woke up looking this amazing’. Though it looks au natural and a little wild, this style takes a lot of upkeep. This is one for a creative soul. Very narrow and deeply curved, the Dali turns upwards like a little moustache smile. Thick and wide with minimum upkeep, this style is worn long to cover the top lip just slightly. Otherwise known as the dad mo. Movember is a light hearted event with a serious motive: it raises much needed funds for men’s health, most specifically prostate cancer. In the UK, one man dies of prostate cancer every single hour, of every single day. This equates to more than 10,000 every year. With donations breaking the £11m ceiling last year, this year the power of the mo is set to be even more spectacular. Find out all about Movember right here, and discover some more moustache styling tips from the pros right here. This entry was posted on Tuesday, November 15th, 2011 at 2:00 pm and is filed under Men, Special Post. You can follow any responses to this entry through the RSS 2.0 feed. You can skip to the end and leave a response. Pinging is currently not allowed.